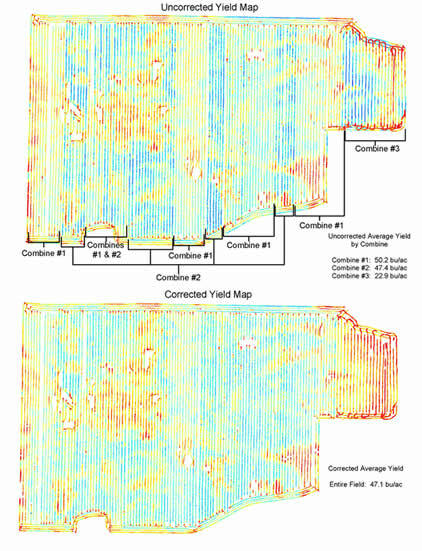 We offer many different yield mapping options. We can print yield maps from most popular brands of yield monitors. For customers near our Mapping Office in Remington, Indiana, bring in your data cards from your combine, and we will download the data right into our system for you. Otherwise, download the data onto your home computer and e-mail us the data. In addition to simply printing the yield maps, we can also correct your yield maps to reduce and eliminate errors due to incorrect swath width settings, inaccurate GPS data, end-row turnarounds, and others. If more than one combine is operating in a single field, we can merge the yield files from the two combines, as well as correcting for differences in calibration settings.